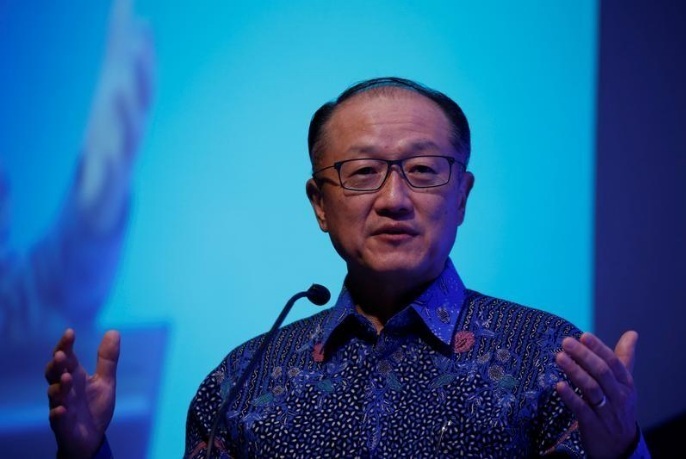 File photo: World Bank Group President Jim Yong Kim delivers a speech during the Indonesia Infrastructure Finance Forum in Jakarta, Indonesia, July 25, 2017. SINGAPORE - The World Bank raised its economic growth forecasts for developing East Asia and Pacific for this year and 2018, but added the generally positive outlook was clouded by risks such as rising trade protectionism and geopolitical tensions. The Washington-based lender now expects the developing East Asia and Pacific (EAP) region, which includes China, to grow 6.4 percent in 2017 and 6.2 percent in 2018. Its previous forecast in April was for 6.2 percent growth in 2017 and 6.1 percent growth in 2018. “The economic outlook for the region remains positive and will benefit from an improved external environment as well as strong domestic demand,” the World Bank said in its latest East Asia and Pacific Economic Update report on Wednesday. The outlook, however, faces risks from rising trade protectionism and economic nationalism, which could dampen global trade, as well as the possible escalation of geopolitical tensions in the region, the bank said. Increasingly hostile statements by U.S. President Donald Trump and North Korean leader Kim Jong Un in recent weeks have raised fears of a miscalculation that could lead to war, particularly since Pyongyang conducted its sixth and most powerful nuclear test on Sept. 3. “Because of the region’s central role in global shipping and manufacturing supply chains, escalation of these tensions could disrupt global trade flows and economic activity,” the World Bank said. That could be accompanied by financial market volatility that would likely hamper economic growth in the region, and there could also be a “flight to safety” that spurs capital outflows, the bank said. The World Bank said it now expects China’s economy to grow 6.7 percent in 2017 and 6.4 percent in 2018. Its previous forecasts were for China to grow 6.5 percent in 2017 and 6.3 percent next year. China’s economic growth is projected to moderate in 2018-2019 as the economy rebalances away from investment and external demand toward domestic consumption, the bank said. The World Bank cut growth forecasts for several countries in Southeast Asia including Myanmar and the Philippines, while raising forecasts for Malaysia and Thailand. “Businesses in Myanmar appear to have delayed investments as they wait for the government’s economic agenda to become clearer,” said the bank. It cut Myanmar’s growth forecasts by 0.5 percentage points for both 2017 and 2018, to 6.4 percent and 6.7 percent, respectively. More than half a million Rohingya have fled from a Myanmar military crackdown in Rakhine State launched in late August that has been denounced by the United Nations as “ethnic cleansing”. In the Philippines, a delay in a planned government infrastructure program has softened the economic growth prospects, the World Bank said. It added that Malaysia’s growth is gaining a lift from higher investment and a recovery in global trade, while Thailand’s growth forecasts have been revised higher due to a stronger recovery in exports and tourism. The World Bank raised its economic growth forecasts for developing East Asia and Pacific for this year and 2018, but added the generally positive outlook was clouded by risks such as rising trade protectionism and geopolitical tensions.